To function effectively our cells require a continuous supply of life giving oxygen and a means of removing CO₂ (carbon dioxide). This is achieved by synergy between the respiratory and circulatory systems. The respiratory system is the interface between our external world and our bloodstream, allowing gaseous exchange. 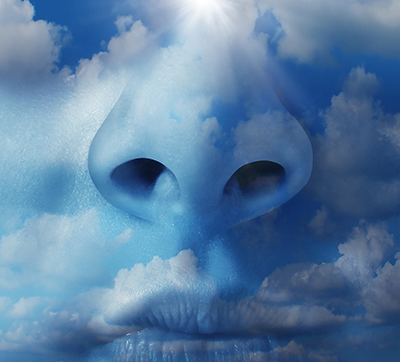 Air breathed in through our nose and mouth is filtered by nasal hair and warmed before it passes into the lungs. Air moves through the pharynx, at the back of the throat, down to the larynx. The larynx, (voice box) lined with a series of cartilaginous folds splits into two; one to the lungs, the other passes food to the stomach. The innermost folds (true vocal chords) vibrate to make speech. The trachea, made up of rings of rigid hyaline cartilage to prevent collapse during inspiration, extends from below the larynx, located underneath the Adam’s apple. The epiglottis is a flap of skin that snaps shut when we eat to prevent passage down the wrong tube. The trachea divides to form two bronchi, connecting to the lungs. 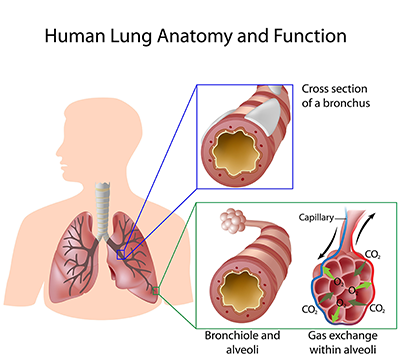 Within the lungs the bronchi branch to form smaller bronchi, much like a tree reaching for sunlight, eventually forming bronchioles; the smallest of these ‘twigs’ are called terminal bronchioles. The terminal bronchioles blossom to form alveoli; that resemble small cauliflowers. The alveoli’s greater surface area has a network of tiny blood vessels, giving the lungs the largest blood supply of any organ; allowing filtering of atmospheric gases into our blood stream. There are over 300 million alveoli! 79% of the air we breathe in is nitrogen (N₂) and 79% of the air we breathe out is N₂, therefore none enters our blood stream. 21% of the air we breathe in consists of oxygen dependant on pollution; we utilise around 4%. 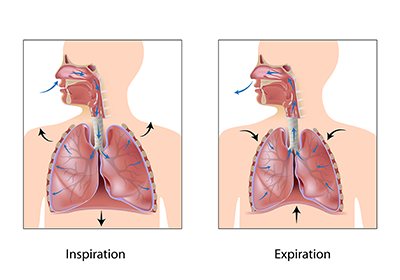 The movement of gases is when air (O & N₂) is drawn down into the lungs by a vacuum effect; this effect is created when the diaphragm flattens during inspiration (breathing in); the chest cavity expands increasing in volume, causing the differences in pressure between the mouth and lungs, pushing air into the lungs. The pressure outside is greater than the pressure inside, causing a vacuum effect. Diffusion is the movement of gases from an area of high pressure to an area of low pressure. Diffusion assists oxygen uptake and CO₂ release. Oxygen flows from the mouth to the lungs because the concentration of oxygen is greater in the atmosphere, compared to the lungs; CO₂ flows in the opposite direction for the same reason. When oxygen reaches the alveoli it continues to diffuse into the bloodstream, because the concentration of oxygen in the alveoli is greater than in the blood stream. The membrane of each alveoli, are covered by a dense network of capillaries. The alveoli’s tiny capillaries are only one cell thick, allowing gases to diffuse through them easily. 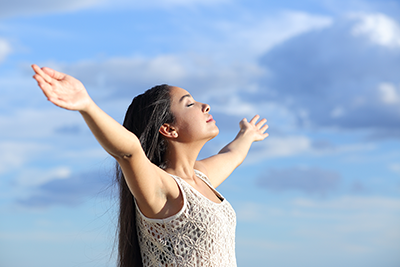 Oxygen passes into the blood, as CO₂ passes from the blood into the lungs to be exhaled. Within our blood oxygen binds to haemoglobin in the red blood cells (haemoglobin is a protein that carries oxygen, CO₂ and carbon monoxide CO). 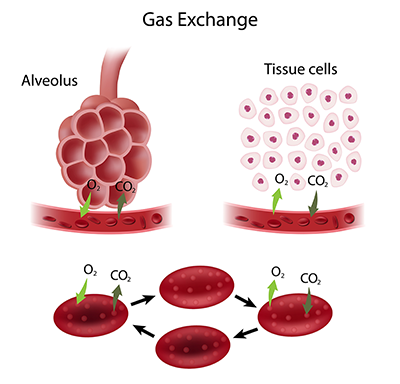 The assimilation of oxygen into our red blood cells is synchronised with the separation of CO₂ diffusing from the blood into the lungs. The red blood cells are pumped via the pulmonary vein back towards the heart. This constant flow of blood past the alveoli maintains the ideal conditions for diffusion to occur. 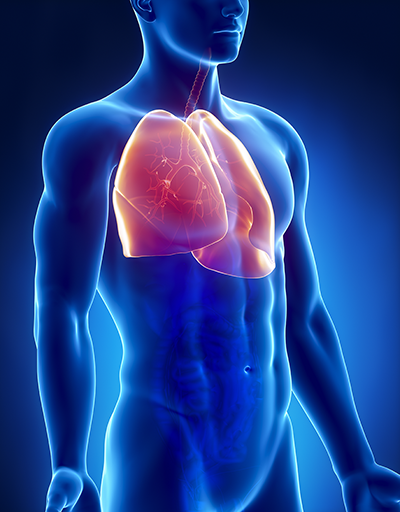 External respiration is the exchange of gases between our lungs and our blood. 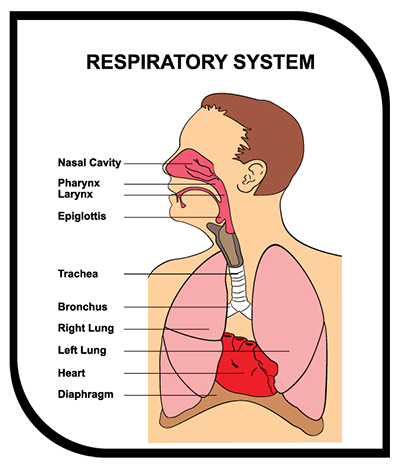 Internal respiration is the exchange of gases between our cells and our blood. As we breathe in our diaphragm muscle contracts and flattens, increasing the volume of the chest cavity, creating a vacuum within our lungs. The pressure in the atmosphere being greater pushes air into our lungs. As we breathe out our diaphragm muscle relaxes, returning to a dome shape decreasing the volume of the chest cavity, creating greater pressure pushing air out of our lungs. Shallow breathing involves contraction of the intercostal muscles (between our ribs). This type of breathing is used in high intensity training such as HIIT training. Refer to chapter, HIIT IT Part II. Deep breathing causes the stomach to protrude making room for the diaphragm to move down; practiced in activities such as yoga. Chemical receptors monitor levels of CO₂, oxygen and blood acidity, adjusting breathing rate accordingly. Stretch receptors sense over-inflation of our lungs, decreasing the respiratory rate. Low blood pressure causes an increase in breathing rate and vice versa.